This is the ladies version but it’s also available as a matching childs pattern so you can even do matching “Mommy and Me” dresses! Get the child’s version here. Or get both as a bundle here. Give it a try you may be pleasantly surprised and follow the recommendations for fabric selection because it truly does make all the difference in the fit and finish. Very versatile given your fabric choice, from casual to formal. I believe that my top will be worn a lot, super cool and casual for summer (cannot wait to pack it for my next cruise) or dressed up for more formal wear. Chiffon awesome fabric to do that. 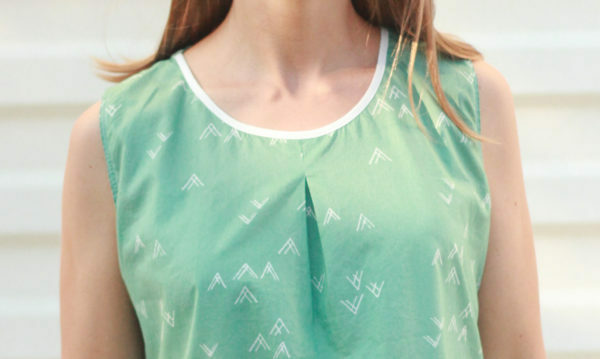 There are so many small details that make this pattern attractive, the cut out back, the front pleat! 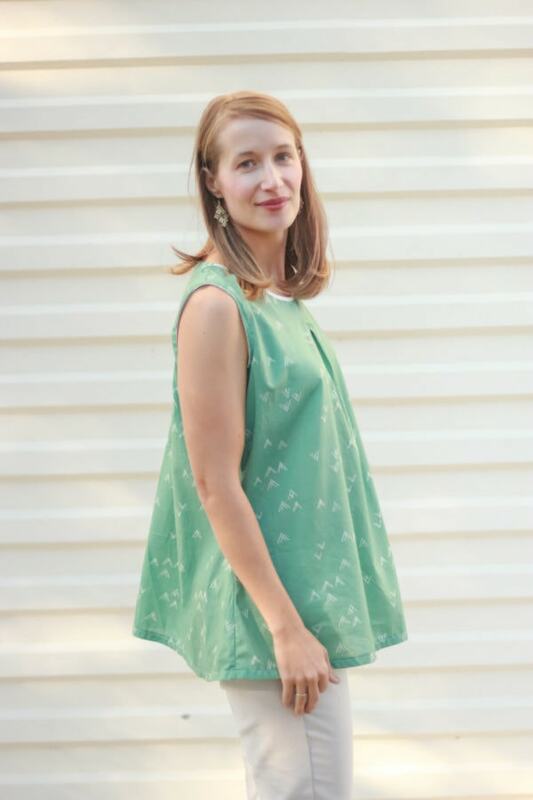 Also top or dress length and sleeveless or long sleeve make it perfect for all seasons! Go for it! You get a dress AND a shirt! I would say that is a very easy pattern perfect for beginner. Easy to follow, you can do a lot of version. It is a great way to expand your skills, and the gathering on the back piece makes it a truly unique garment! Nice, relaxed fit with ample room for bust and waist. I like seeing the design on the back. It’s simple yet unique design. Make sure you use fabric with a good drape/flow. It’s a beautiful pattern with interesting details. Don’t expect it to be tight fitting, it’s going to be loose, embrace it, it looks great! Use a very soft fabric if making the dress, it’s a better fit. I would say it is a lovely pattern and pretty easy to sew up, but be selective in your fabric choice. The type of fabric used could make all the difference. 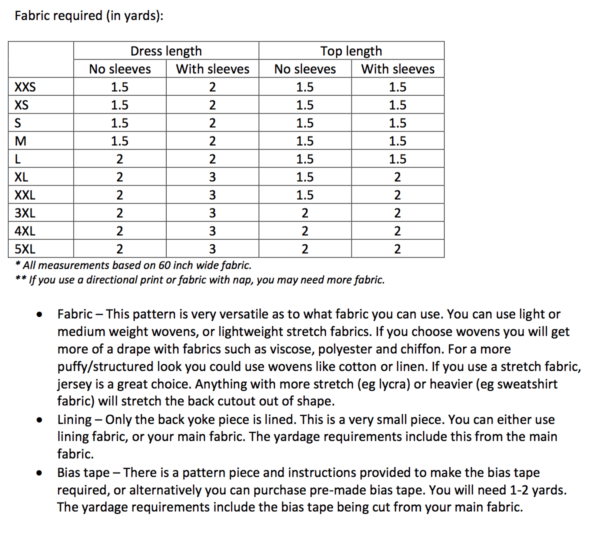 The fabric suggestions in the pattern are right on though, so stick to those. Super quick to sew , pattern will suit most fabrics from knit to light weight woven. Will be making lots of this top . A wardrobe staple. I like how its a comfy swing top without excessively flared, such that i may look preggy. the swing is just nice! This pattern is so cute. My favorite feature is the back side of this garment.. it looks complicated to sew but the instructions is as clear as crystal. I am happy that Rebecca Page made this sewing pattern. This is such a lovely pattern. Everything comes together quickly but with such great details. I can’t wait to make another one. This top came together quicker than I expected and delivered a nice, up scale top I can wear casually or dress it up! I really enjoy the back cut-out on this shirt. It gives it a fun little edge. Such a fun pattern! 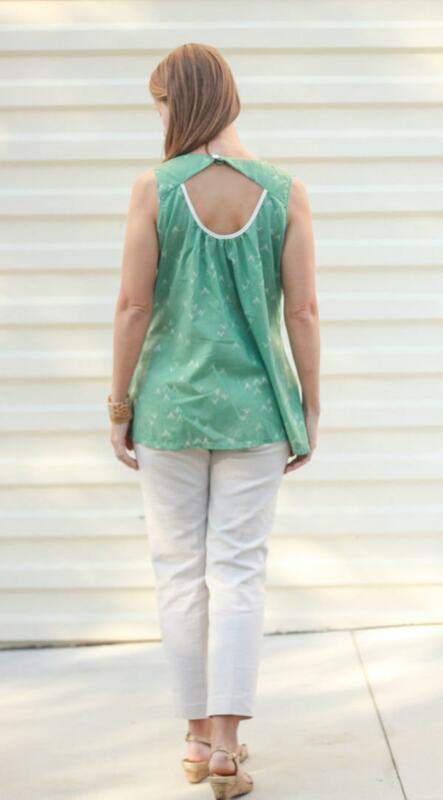 Makes a lovely top perfect for dressing up or down in the warmer months. I love that you can use woven or knit for a completely different look. Great instructions, easy to sew. I love the versatility of this shirt/dress. It can be formal for a night out, or casual for Sunday lunch. Sleeves for winter, or none for a hot summers day. It is truly amazing and you will not be disappointed! This is the perfect summer pattern. 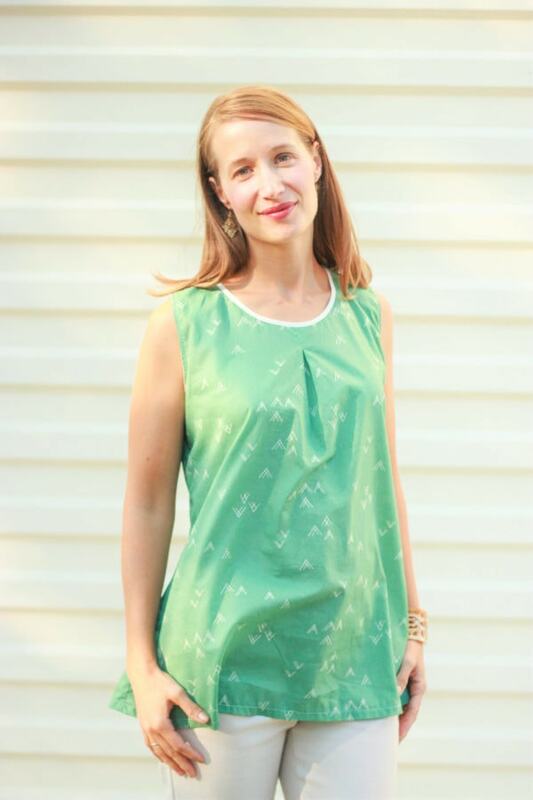 It’s a pretty quick sew and it yields beautiful results. It was a quick sew and it’s a good wardrobe builder! I was intimidated, but the St. Tropez was easier than I thought it would be! The sandwiching of the yoke in the back piece was genius and created a very professional finish. What a lovely top! Flattering and fun to make. 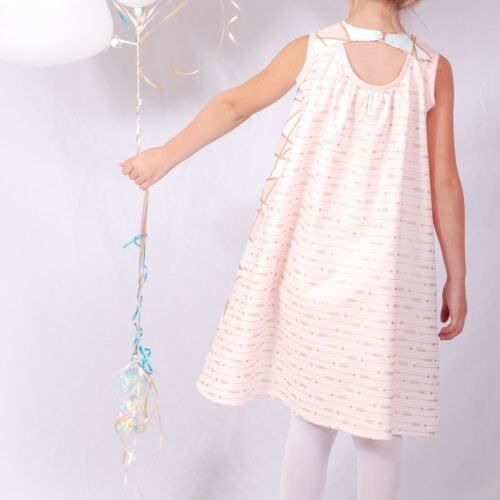 This is a super cute pattern for a quick party dress. The deep pleat in the front bodice can make the silhouette a bit top-heavy, so I would highly recommend for pear-shaped ladies. Loved the cute peek-a-boo window in the back; a very simple closure for sewists who aren’t confident in their zippers yet. Nice flowy dress with lots of space. Pair with a belt and you’ve got a cute outfit. Easy to sew and a good way to get comfortable sewing with bias binding. 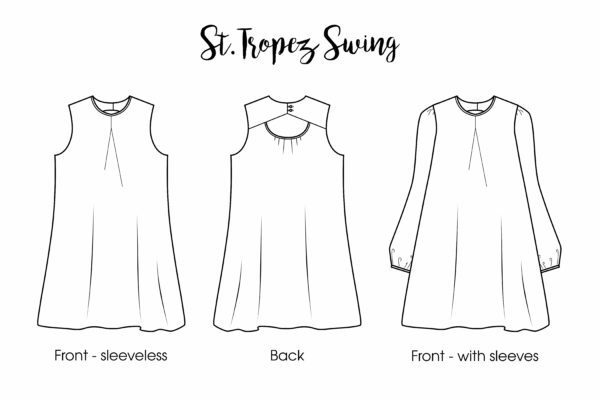 The St. Tropez is an elegant top/dress pattern with thorough instructions and professional finishing techniques that make it look great inside and out. I enjoyed making this dress for my mom. She loves it also. Easy to understand directions and great drafting. My first go with French Seams. They were well explained and easy to follow. Love the back cut out detailing. 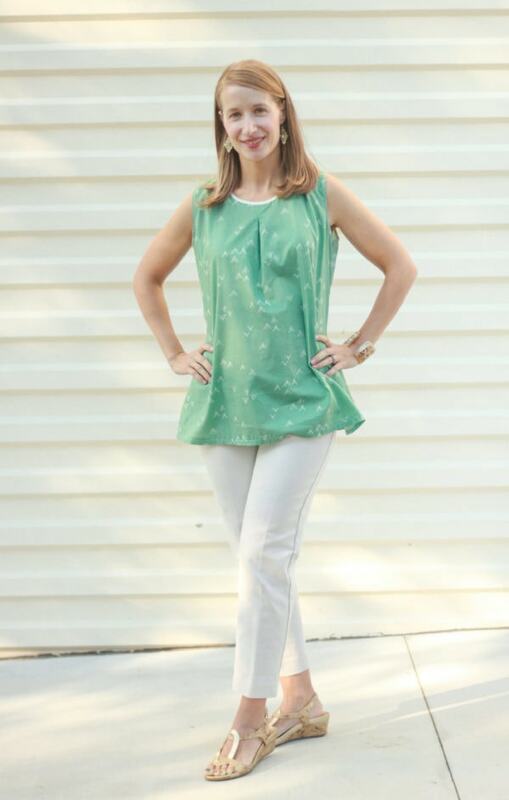 I absolutely LOVE my St. Tropez top, it wasn’t too difficult to figure out And I plan to make more as soon as I can! Super comfy and well written pattern. There is a YouTube video that I consulted to help me figure out the way the facings were supposed to go on to the back. But I think now that I’ve done it once, I can do it again much more smoothly!